Musings from EmbeddedWorld 2019, Nuremberg, Germany. Recently, Drive Rescue were in Nuremberg, Germany, attending EmbeddedWorld 2019. While this event primarily caters for electronic systems, edge computing, IoT and energy efficiency, it also hosts a number of storage device manufacturers. In fact, one could hardly walk 20 metres in the exhibition halls without encountering NAND memory in some form or another, from either systems integrators or the manufacturers themselves. The latter were displaying NAND in more visible forms, such as in USB devices and SSDs. The affable team from Transcend explained how their NAND-based memory products are widely used in everything from industrial machinery, slot machines, robotics to torpedoes. These are areas not normally associated with “boring” storage. Transcend are suppliers to Kuka, one of the world’s largest robotics manufacturers, whose robots are used in everything from car manufacture to nuclear decommissioning. High-quality NAND is essential in applications such as these – for example, a robot will constantly read and write to NAND memory. (Transcend recommends using its “SuperMLC” NAND, which is MLC memory designed to emulate the reliability of SLC, for uses such as these.) Likewise, durable NAND is essential for medical devices that use logging capabilities, such as heart rate monitors. I asked the Transcend team what sets them apart from the competition and the emphatic answer was “quality control”. Transcend source NAND wafers from either Samsung or SanDisk. A wafer is like a large sheet of NAND. The best quality NAND chips (or prime cuts) are in the centre with the lower-quality NAND chips (offal) residing at the fringes. 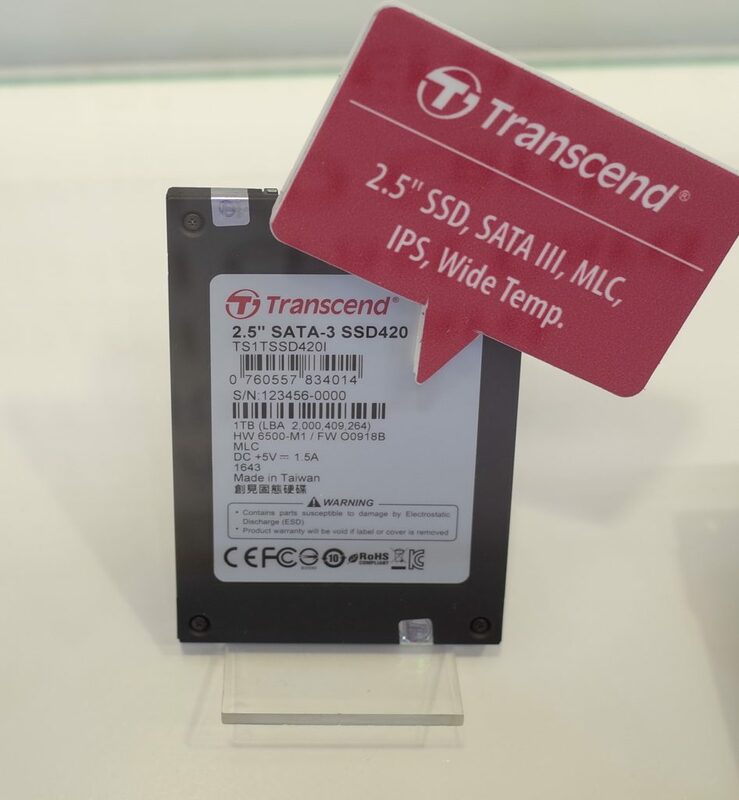 Transcend only use prime cuts of NAND for their memory products. (Low-quality NAND probably ends up in generic USB sticks sold on eBay or in SD cards sold in street markets.) Once cut. the company use an extensive four-stage testing process to weed out any defective NAND. This is important if your NAND is being used for torpedo guidance systems. However, even with stringent quality control processes, people still lose data. The Transcend team explained how human error is the biggest cause of failure for their SD cards. For example, they manufacture consumer-level dash cams. For those motorists unlucky enough to be involved in an accident, their first instinct is to seize evidence of the event. So, with their dash cam still running, they pull the card out and, ironically, end up corrupting the very information they want to preserve. Murphy’s Law in extremis. 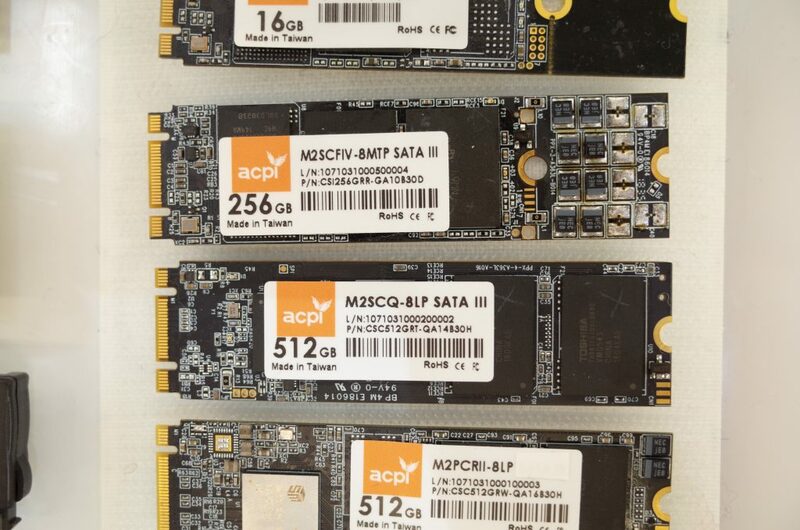 And talking of data preservation on NAND, the Taiwanese SSD manufacturer ACPI sees sudden power loss as a major issue for industrial PC, enterprise servers and professional grade photo systems. This can still occur even with a UPS deployed. For this reason, ACPI has brought out its “Power Shield” technology for its SSDs. This protects a data write even during total power loss. Capacitors store a residual voltage which enables any tunnelling electrons in the floating gate to reach their destination safely. Sony was a surprise exhibitor at EmebeddedWorld 2019. While not normally associated with SSDs, it has been dabbling in solid-state storage for quite a while. (Primarily sourcing its NAND from Toshiba and controllers from Phison.) Sony’s USB memory sticks and SD cards have been on the market in Ireland for a number of years. Many readers of this blog might be familiar with its distinctive “Memory Stick Duo” cards that were first introduced on the market circa 1998, in the nascent days of digital photography. Those involved in professional TV and film production who use Sony kit will probably be familiar with its SxS cards for professional grade camera equipment. 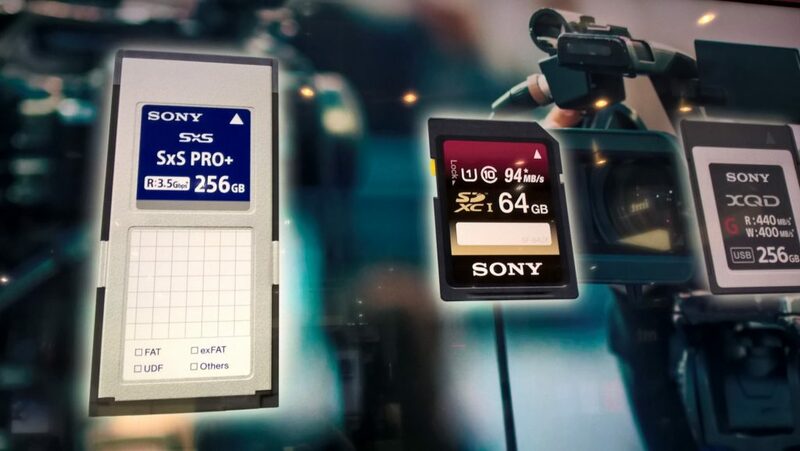 These cards, now called SxS Pro+, are still being produced by Sony and offer capacities of up to 256GB, offering write speeds of up to 400MB/s. For commercial/industrial customers, Sony now offers a range of M.2 SSDs optimised for heavy-duty use. It will shortly be introducing external SSDs for the consumer market with USB-C interface and capacities of up to 960GB. Before floating-gate technology was invented, semiconductor design had to rely on EPROM and EEPROM. But both of these technologies were relatively slow and could only store the most basic of information. That was until 1984, when Fujio Masuoka of Toshiba came along and wrote a research paper on a revolutionary type of memory design called NAND. Toshiba’s first NAND went to market in 1989 and the rest is history. NAND has been getting denser, faster and more capacious with every new iteration. 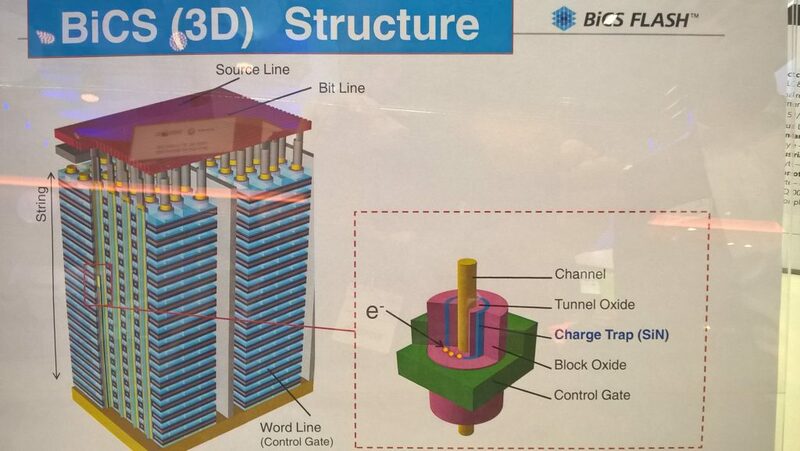 The current iteration of NAND that Toshiba is marketing is its 64-layer 3D BICS NAND. One of the Toshiba team described how the market is now in a state of “3D fever, as everyone wants a piece of the 3D NAND action. Toshiba is currently using 15nm 64-layer 3D TLC “Bics” NAND in the majority of its SSD devices. According to Toshiba, its “charge-trap” technology is more reliable than “floating-gate” (which is actually a technology from the 1970s). The latter transistor design holds electrons like “water in a glass”, whereas “charge-trap” technology is “more like a sponge”. The electrons are less likely to leak and, therefore, more likely to maintain the integrity of your data. The next iteration that Toshiba expects to commercialise is its 96-layer 4-Bit QLC NAND later on this year. Although Toshiba is known for inventing NAND, they still manufacture mechanical hard disk drives. (In fact, Toshiba’s hard disk and SSD operations have now been spun into two separate divisions). With the current trend for Big Data analytics and virtualised storage systems, Toshiba is adapting its product lines. For example, its “AL” series of disks are designed for use in Tier 1 enterprise servers. These disks use a SAS interface and have capacities of up 2.4TB with a MTTF of 2 million hours. Toshiba’s “MG” series caters for enterprise storage arrays. The MG07 and MG08 can hold up to 14TB and 16TB of data respectively. These whopping storage capacities are achieved with the assistance of helium, which is injected into the main chamber of the drive. This is then laser-sealed. Helium enables smoother writes that are closer to the platters and reduces power consumption. Moreover, these disks contain 9 platters instead of the competition’s 8. (We’re glad to see that Toshiba is not skimping on platters. As a data recovery company, we know what can happen when manufacturers try to economise on them… Seagate’s calamitous “DM” series of 3.5” disks being a prime example). This series of disks also use MAMR (Microwave Assisted Magnetic Recording) whereby a Spin Torque Oscillator of frequencies between 300GHz and 300MHz saturates the bit areas of the platter with a concentrated microwave field, which enables more reliable writes in high-density disks. Scaling up this technology means that we might be seeing 28TB or higher capacity HDDs in the not too distant future. It will be interesting to see what approach Seagate will adopt with its disk-heads as its HAMR technology has come in for sustained criticism for stressing disk platters (not to mention the users…) For non-data centre disks, Toshiba also makes disks for the SME and personal market. Its N300 disks, designed for NAS, come in sizes of 4-14TB, designed for 24/7 usage. Toshiba also makes standard mechanical disks, such as the P300 (3.5” S-ATA) and L200 (2.5” S-ATA). Maybe it’s all the crime thrillers that people are watching on Netflix or the Dublin gangland documentaries being shown on Virgin Media One, but there’s been an explosive growth in home surveillance systems in Ireland recently. Similar trends are occurring worldwide and hard disk manufacturers are responding to this demand. 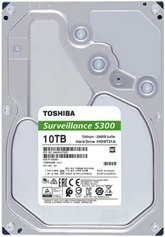 WD already has its “Purple” disks, Seagate its “Skyhawk” line-up and Toshiba its “S300” surveillance hard disks. This disk (picture above) comes in capacities of 5TB to 10TB and is designed for 24/7 operation. It’s a “write-centric” disk, meaning that its disk-heads and firmware are optimised for 90% writing and 10% reading. According to the NAND and SSD manufacturer Micron, this growth can be partially explained by the precipitous drop in prices for 2K and 4K image sensors (a key component of camera manufacture). But growth in surveillance is also being boosted by the next-generation SOC (system on chip) security systems, which use deep learning and AI (Artificial Intelligence). Where once security systems or facial recognition technologies would just capture and store, now they can capture, store and analyse. 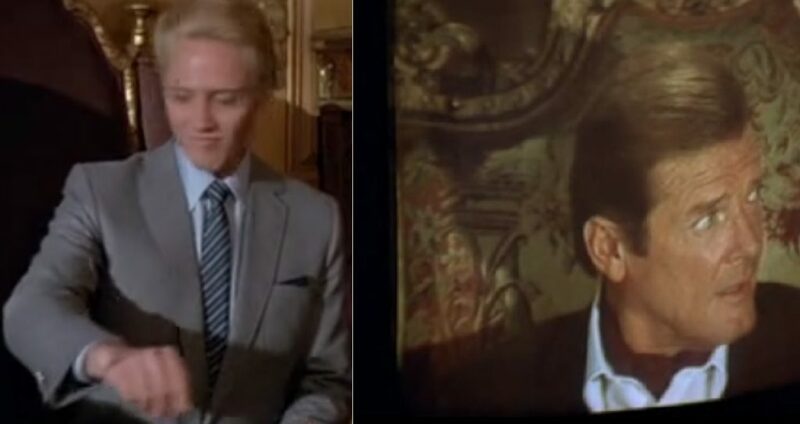 This was presciently portrayed in the James Bond movie The Living Daylights (1987), where the baddie Max Zorin used facial recognition technology in his office to identify James Bond in a matter of seconds. Surveillance systems now need to perform analysis in real-time without the latency incurred by communicating back to a centralised cloud-based server. Imagine an AI-powered surveillance system in an airport that detects a passenger at the boarding gates who is on a “no-fly” list. Even with a relatively fast link to “the cloud”, image retrieval and analysis might still prove too slow. If that same surveillance system used edge-based SSD storage, the storing, analysis and processing of images of the system would be vastly accelerated. In use cases such as these, NAND is the big enabler. A body or dash camera using a 2.5” spinning disk would probably not last too long in the field. While NAND has been on the market for a relatively long time now and its evolution to layered versions or “3D” means we now have higher capacity reliable storage in a very small form factor. Micron was exhibiting its “C200” microSD card which was released at the Mobile World Congress in Barcelona just a few days previously. This Lilliputian card uses 96-layer 1TB QLC 3D NAND with eight 128GB dies. It has write-speeds of 100MBps and read-speeds of 95MBps. 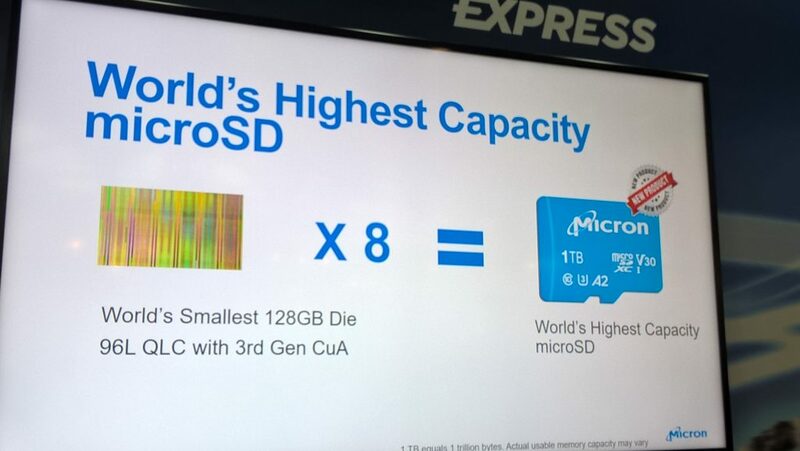 If Micron can scale its NAND to 256-layers, I’ve no doubt that we’ll be seeing 2TB and 4TB versions of this card shortly. While a card like the “C200” might be fine for a consumer-level smartphone or action cam, it might not be the ideal solution for other use cases. For instance, the primary storage in edge-based surveillance systems is often in the camera itself. (Having the storage here eliminates the network congestion that is generated by IP-based cameras and frame loss due to network disruption). The storage medium in such a camera means it is going to be exposed to constant writes. This is something that a QLC-based NAND card would not be able to do! For this, reason Micron has brought out industrial-quality TLC-based SD cards using 3D NAND (such as the MTSD256AHC6MS-1WT). Its high-capacity models can store footage for up to 30 days and come equipped with a card-lock to prevent tampering. Micron also offers a health management API to proactively warn system administrators of potential SD card failure. It’s not only in surveillance that edge-based storage is playing out. IDC Research estimates that in the next 3 years, 45% of IoT generated data will be stored, processed and analysed at the edge of the network. 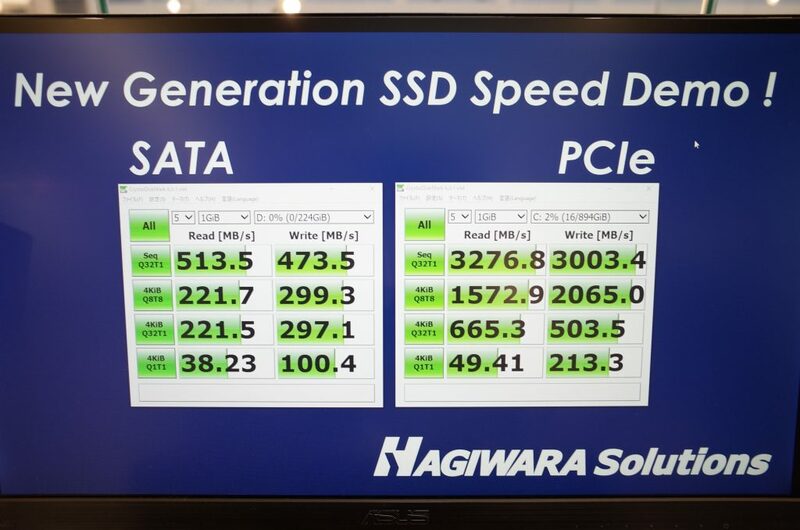 And this is something that NAND and SSD manufacturers are extremely interested in. Edge Computing offers faster response times, more reliable operations in areas of poor internet connectivity and better data security. Most Android smartphone users that use Google Maps’ “offline maps” feature know the benefits of having local storage. It’s often significantly quicker than the device having to communicate with the cloud. It is being touted that autonomous cars are basically going to be “servers on wheels”. It is inevitable that these cars will traverse areas where internet connectivity is poor. Here SSDs and NAND will play a pivotal role in not only mapping, but also enabling the execution of the car’s key software functions. The pervasiveness of high-speed high-capacity is going to make our lives easier. Ever tried to buy a train ticket from a self-service kiosk on a busy rail network at peak time? You have probably noticed that the loading of the menus and timetable information is laboriously slow. It’s more than likely that the ticketing machine, along with hundreds of others, was simultaneously communicating with a central server and the network was congested. Taking an “edge computing” approach to this problem, key information, such as timetable information, is stored locally on the ticket machine (just like Google “offline maps”) while data, such as real-time updates and seat availability, are transmitted in the form of compact, computed findings rather than raw information. Or let’s take the example of a wind farm off the west coast of Ireland. While it’s probably still within connectivity reach of 3G or 4G networks, constant communication might be more problematic. 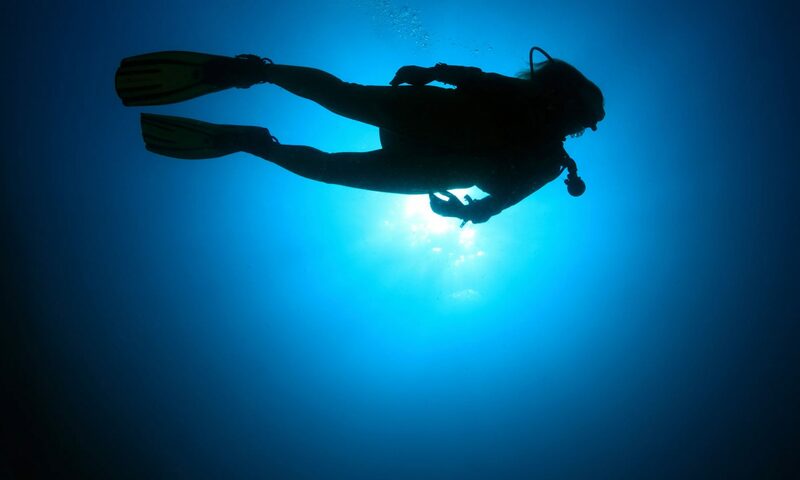 Storage on the “edge” can mean there is no data loss or operational failure in the event of limited connectivity. This is not to say that the Cloud is going to become redundant, but it will take a more passive role in our lives – partly enabled by advances made in NAND memory technology. Thank you, Mr Masuoka! We were recently helping a customer solve an issue with an inaccessible Maxtor M3 (Model HX-M201TCB/GMR) disk which was showing a flashing blue light when connected to a PC. The disk made a healthy spinning noise but was not appearing in Windows explorer. Much to the dismay of the user, a university lecturer, over 3 years worth of PowerPoint presentations were not appearing. Inside the Maxtor enclosure, we found a Seagate disk which was no surprise as the Maxtor brand is owned by Seagate. The first problem we discovered with the disk was an overflowing G-List. This an area of the firmware designated for recording bad sectors. Using specialised data recovery equipment which can manipulate the disk at firmware level, we cleared this list. Next problem was the 19,872 bad sectors. We programmed our recovery system to read the disk allowing for a read-delays of up to 900 milliseconds. We also programmed our system to read the disk using a block size of just 60 sectors per read. This would allow us to maximise the chances of the best possible recovery for the client. Now with an image of disk, we programmed our system to image the disk in reverse mode. This covers areas which the forward disk-read passes would have ignored. On completion, the bad sector count had been whittled down to just 944. 17GB of PowerPoint lectures (.PPTX files) were recovered and reunited with the delighted user. 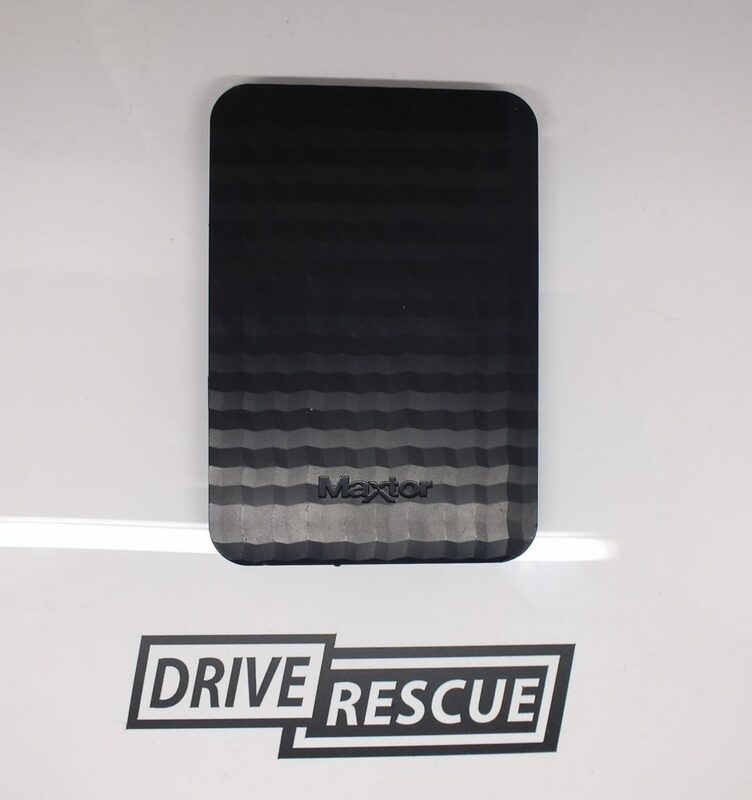 Need to recover files from a Maxtor M3 external hard disk in Ireland? 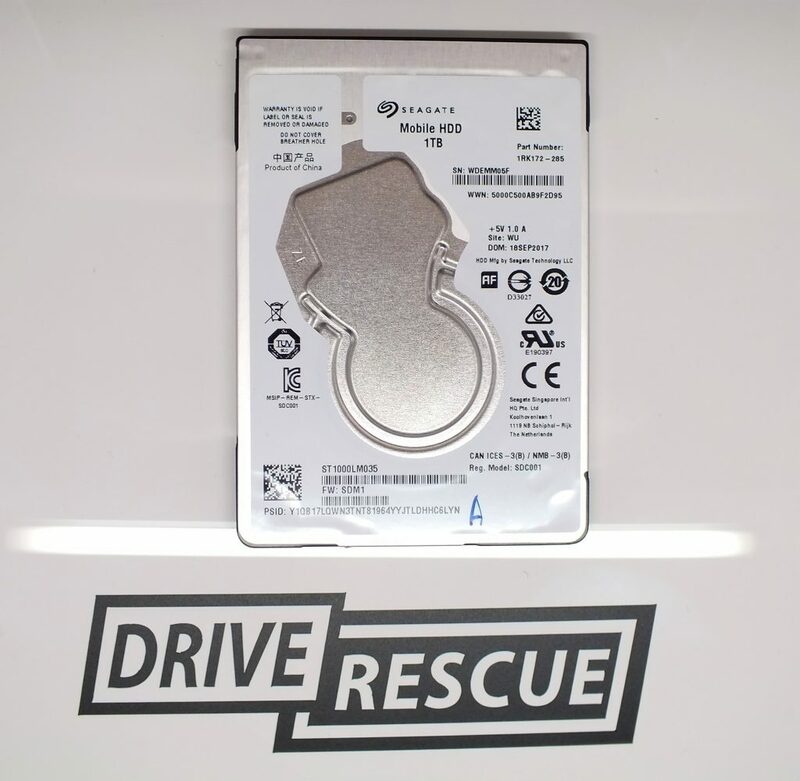 Drive Rescue have been recovering data since 2007 and can help you. Visit www.datarecoverydublin.ie for more information. Or call us on 1890 571 571. 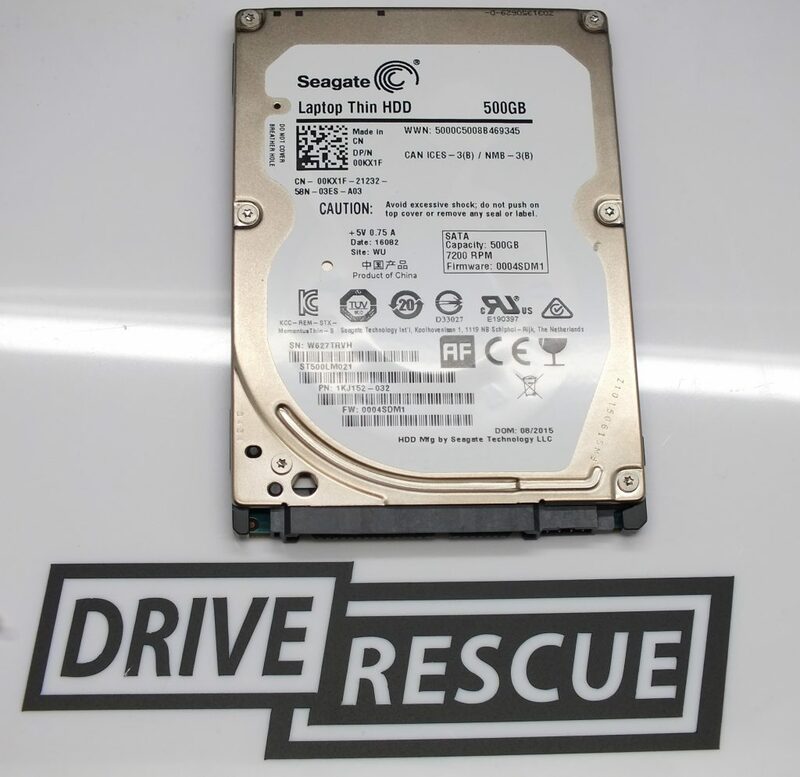 Last week Drive Rescue recovered data from this hard disk which was removed from a Dell laptop. The disk had a seized spindle (see previous blog post for another Seagate disk with a seized spindle, the recovery process was similar). The user’s IT support team from a company in Carrick-on-Shannon, Co. Leitrim came to us for assistance because the Seagate disk was making a buzzing noise when trying to initialise. Even after recovery, the volume was still inaccessible because the disk was encrypted with TrueCrypt (AES 256 in XTS mode). However, after the user had emailed us the encryption key, we decrypted the disk and were able to mount the NTFS formatted volume. All of their Solid Edge (.IGS and .IGES) design files were successfully recovered. The ST1000LM035 is a mechanical 1TB 5400RPM S-ATA mechanical disk from Seagate introduced in 2016. It’s capacity and thin 7mm form factor has proven extremely popular with laptop manufacturers such as Dell, Acer, Asus and HP. The aforementioned companies all desiring to make their computing devices as slim as possible. In turn, since around 2010-2011, hard disk manufacturers have responded by introducing thin form factors (7mm) for their 2.5” S-ATA disks. (The standard 2.5” S-ATA being 9.5mm). However, from our experience spindle motors used in “thin” disks have a high propensity to fail than motors used in standard 9.5mm disks. In early generation hard disks, spindle failures such as seizures was an extremely common problem. Most of these disks using conventional ball bearings had a tendency to experience a phenomenon known as “non-repetitive run out vibration”. This occurred due to nano-metre inconsistencies found on the bearing balls causing read/write interference. In worst case scenarios the spindle would seize altogether making the disk inoperational. Then around 2002-2003, spindle motor manufacturers began using fluid-dynamic bearings. This was a paradigm shift for mechanical hard disk design. Fluid dynamic bearings use a fluid such as oil between the bearings and the shaft. When the shaft rotates the pressure generated by the fluid helps the bearings move more smoothly. While this led to greater disk reliability, it also made hard disks run more quietly and saved computer users the irritation of having to listen to metallic scraping noises. But the pull of technological innovation never sleeps. Just as spindle motors used in 9.5mm disks were going from “reliable” to “extremely reliable”. Spindle motor manufacturers had to go back to drawing board to design models suitable for 7mm disk form factors. This would mean a complete redesign or a compromised design. Spindle motor size can only be 70-75% the thickness of the disk. Most spindle manufacturers seem to have taken their motor designs for 9.5mm disks and “cut them down to size” to fit the smaller form factor disks. From a reliability standpoint, the “thinner and lighter” trend pervasive in hardware at the moment is a classic example of two steps forward one step back. With this slimmed down design, the bearings have less room to build a suitable magnetic force needed for a 5400 RPM platter. Maybe this is because the motors used in this form factor are not as reliable as those deployed in 9.5mm disks. (Other 2.5” 7mm disk models such Western Digital’s WD10SPCX and Seagate’s Momentus Thin also exhibit spindle motor problems). Perfect alignment between the platter unwinder tool and notches of the platter ring. Otherwise torque forces might incur further damage. You must apply a clockwise force. Remember, most hard disks spin in an anti-clockwise direction. The platter securing ring must be carefully removed with a tweezers. These must be free from any residual magnetic forces and must not touch the platter surface. The transplanted platter must align perfectly with the notches on the donor disk. This can be achieved by rotating the platter-tool until you feel a slight click. Once the hard disk ramp has returned to its original position the disk lid can be safely closed. In recovering this disk this methodology was followed. But upon disk initalisation the volume could still not be seen by our host system. Such surprises are to be expected in data recovery. One common reason for such an occurrence is the new spindle not being “tuned” to the new disk. This can be remedied by using a firmware emulator. We did this and restarted the disk. This time a volume appeared with the client’s Word, Excel, Photos, PDFs and .RVT (Revit) files now being accessible. We performed an integrity check on these and they were perfect. These files were extracted onto a USB portable disk and delivered to a very happy customer. Drive Rescue is based in Dublin, Ireland. We hope you have found this post useful and interesting. We have also successfully retrieved data from the 2TB model (ST2000LM007) of the disk mentioned in this case study. Other “thin” disks which we recover data from include the Seagate Momentus Thin, WD Blue models WD10SPCX, WD10SPZX and HGST Z5K500, 5K1000. 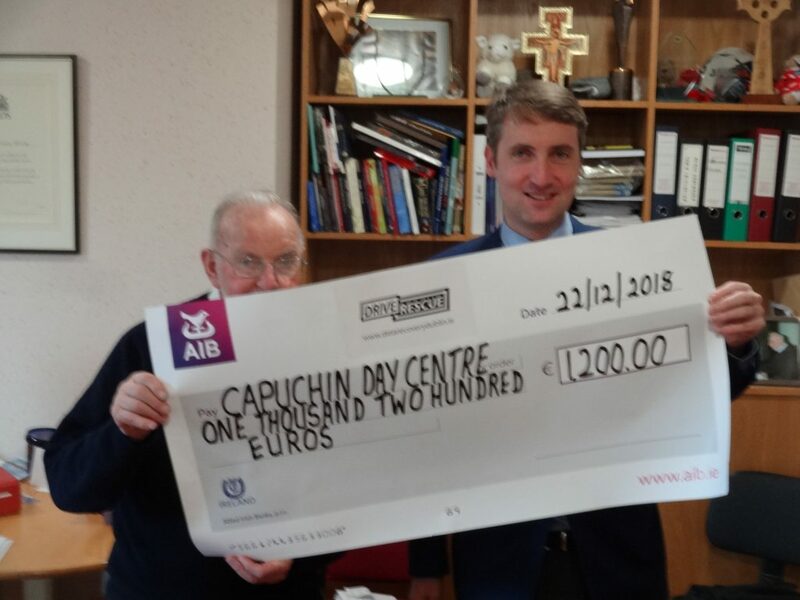 Drive Rescue were recently at the Capuchin Day Centre to present this extremely worthwhile charity with a donation. We know this does not solve the homeless problem in Dublin but some help is better than no help. Cyclic Redundancy Check is a mathematical equation used to ensure the integrity of data. It works by multiplying the number of bits in the data packet by a pre-determined number prior to data transmission and retains the answer. Once the data is received, it executes the same equation again. If the two answers match, your computer processor knows the data is intact. CRC checking is commonly used in TCP/IP networking but is also in disk-to-disk communication such as when an external hard disk or USB memory device is connected to a computer. Typically, the Cyclic Redundancy Check error message tells us there is a problem with a storage device. In a small minority of cases, the issue can be resolved by running the Checkdisk (Chkdsk) command on the disk within Windows. However, in the vast majority of cases the Cyclic Redundancy Check error message is indicative of a more serious problem with a disk. In this particular case the client’s Seagate Backup Plus disk had over 20,000 uncorrectiable bad sectors. We used our specialised data recovery equipment to “read around” these sectors and then performed a “read retry” operation on them. Our equipment does this at a very low level, meaning we can access data which would be otherwise unreadable to operating systems such as Windows, OS X or Linux. We were successful in recovering all the file types needed by the client. These included .docx, .xlsx and .mdf (Microsoft Access) files. Case was closed with one extremely satisfied customer! We recently recovered data from a QNAP TS-253 Pro. 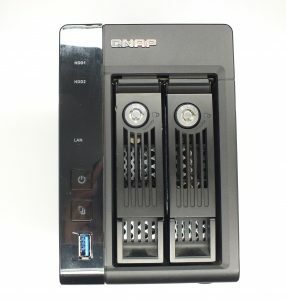 This is a popular two-bay NAS device which uses the QTS operating system. 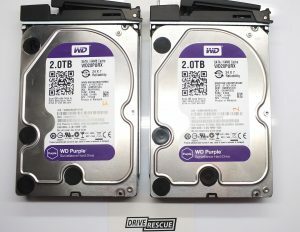 This particular NAS was using two WD Purple (WD20PURX) S-ATA disks formatted with EXT4. Even though the device was set up in a RAID 1 configuration – it experienced an event which corrupted the firmware of both disks. The problem was surmountable as we recovered 100% of the client’s data, but this case presents a number of important lessons in secure data management. The roots of the problem go back to when the device was first set-up. Their IT administrator chose two WD purple disks. These 5400 RPM disks are primarily designed for use with NVRs (network video recorders) and DVR (digital video recorders). The firmware in them is optimised for constant ATA streaming of contiguous data. It is not really designed for the kind of random reads and writes as you would expect in an administrative office. Moreover, the error correction algorithms used in these disks are tuned for speed with data integrity taking a back seat. It is really not surprising then that just after a couple of months usage – the data on the volume became inaccessible. And of course, Murphy’s Law kicked in with both disks failing simultaneously. How this data loss situation could have been averted. Ideally, the client should have been using WD Red disks (or other disks designed for NAS) to prevent this problem from occurring. And of course, they should have been backing up their QNAP. A NAS (even configured in RAID 1) is not a backup in itself. They should have been using an app such as Duplicati backing up an off-site server such as S3 or B2. As virtualisation becomes more prevalent, it’s nice to have some VHD recovery tools in your arsenal. One great tool that we can recommend is Hyper-V Recovery from SysTools. If you have a VHD which has become corrupted or inaccessible, give it some tender loving care with Hyper-V Recovery. It uses smart algorithms bundled with an intuitive interface to repair the dynamic and static VHD files on FAT and NTFS. A customer recently delivered a Lenovo Thinkpad X1 to us for data recovery. When the system would start, the error message “a disk read error occurred” would appear on the screen. The POST process will halt at this point. We opened up the system and found a proprietary SSD made by SanDisk (SD5SG2-256G) using a form factor of (70mm x 20mm) and a 20+6 connector pin. Proprietary SSD form factors and connectors were common in the early days of mass SSD deployment in laptops and tablets as device manufacturers raced to make their devices as thin and light as possible. The SanDisk SSD recovery process. We put the drive into “technological mode”. This is the same mode SSD manufacturers use to perform disk repair and diagnostics. Then using a custom-adaptor for this SSD we connected it to our firmware emulator and uploaded a Marvell 88SS9174 firmware module. The Windows 10 and recovery partition appeared but was still not readable. However, adjusting read parameters on our equipment (which dynamically adjusts voltages used to read NAND cells), we able to access the volume in full. All the customer’s Word, Excel, Calc and Quantrix were successfully recovered onto a USB external disk. 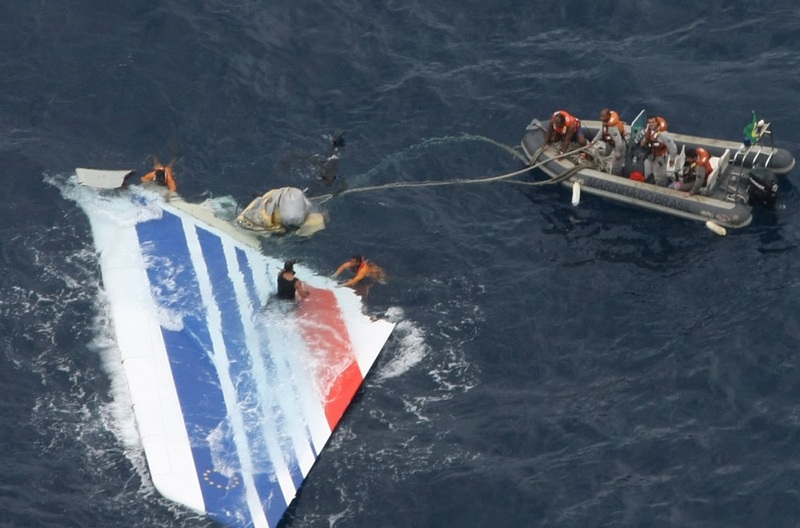 The tail fin of flight Air France 447 – Problem fixation can have tragic consequences. On the 29th of December 1972 Eastern Airlines flight 401 takes off from a bitterly cold New York en route to Miami. 163 passengers are on board, most of them hoping to celebrate the New Year in the sun. Approaching Miami the pilot presses the button to activate the landing gear. Normally, a green light illuminating in the cockpit indicates successful deployment. However, in this case, no green light illuminates. The crew removes the bulb and blow on it to remove any dust. They screw it back tightly. Meanwhile, they fail to notice that the autopilot has become disengaged and the aircraft is now losing altitude. However, the crew is so fixated on fixing the bulb they fail to notice the rapid descent of the aircraft. Being night time, they have little visual cues. Their aircraft stalls and hits the ground. 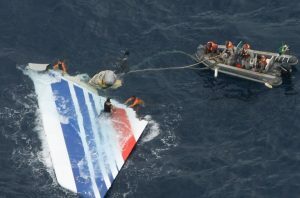 Only 75 of the 163 passengers survive the crash. Fast forward to 2009, Air France flight 447 leaves Rio bound for Paris. Just three hours into the flight, the aircraft’s pitot tubes (used to detect airspeed) malfunction. This causes the autopilot to disengage. The cockpit becomes a cacophony of sirens and alarms. The pilots fixate on raising the plane’s nose when they should have been lowering it. The aircraft stalls. Tragically, according to aviation experts, the type of stall their aircraft experienced was recoverable from. However, the pilots were so fixated on raising the plane’s nose – they fail to recover the aircraft from its stall and it plunges into the South Atlantic. These two cases illustrate how problem fixation can sometimes have tragic consequences. You might be thinking how does this relate to data loss? Well, unfortunately, problem fixation is also an issue in the world of information technology. Hard disk failure provides a classic example of this. When a disk is failing, some end-users and sys admins can easily mistake the symptoms of a failing disk with another un-related problem. This is understandable because symptoms of a failing disk will often manifest themselves in unexpected ways. For example, a failing disk can cause an operating system such as OS X or Windows to throw up all sorts of spurious error messages. This can lead to some frantic googling of symptoms which have little or no relation to the real problem. Likewise, the symptoms of a failing hard disk can often mirror those of failing hardware components such as RAM or graphics cards. And then of course, there is the issue of viruses and malware – the symptoms of which also closely resemble those of a failing disk. Applications may fail to start or run painfully slow. Some users will perform virus and malware scans in their efforts to remove a non-existent infection. The potential for problem fixation does not end there though. When a failing external hard disk is connected to an operating system spurious error messages like “Data Error – Cyclic Redundancy Check” (Windows) or “you need to format the disk in drive E: before you can use it. Do you want to format it?” (Windows) can be thrown up. As for NAS devices, these can be a veritable Pandora’s box of cryptic error messages which users can end up fixating on. Take for example, Buffalo’s error coding system which begins with “E”. You might get an ”E13” message or “E14” “E15”, “E16” “E22” “E23”or “E30”. All of which might look like something written on the back of a packet of Skittles but are all basically reporting the same thing “there is something seriously wrong with one of your disks”. However, if a user goes down the Google rabbit hole with these error messages – valuable time can be lost, all while a disk’s condition might be deteriorating rapidly. The philopsher William of Ockham (of Ockham’s Razor fame) once said “With all things being equal, the simplest explanation tends to be the right one”. And there is some truth to this. If a computer system or storage device is acting strangely – sometimes going back to basics is a worthwhile strategy. Start off with performing disk diagnostics first to find out whether the disk(s) are healthy or not. But fixating on particular error messages wastes valuable time especially when the underlying problem might be a failing disk. Finding this out quickly affords you the opportunity to perform a complete disk backup and possibly negating the need for a data recovery service!